The top four players cumulatively accounted for a little short of 80% of the global point-of-case diagnostics market in 2015, rendering its vendor landscape highly consolidated. The companies at the top Abbott Inc., Becton Dickinson & Co., Alere Inc., and F. Hoffmann-La Roche Ltd, finds Transparency Market Research (TMR) in a new study. “These companies boast a strong product portfolio, which has aided in their dominance,” said a leading TMR analyst. In the forthcoming years, the market is expected to witness the leading companies expanding their distribution network across India, China, Latin America, and Africa. These nations provide gigantic scope for the enterprises offering point-of-care diagnostic solutions as they witness a high prevalence of unmet medical needs. According to TMR, the global point-of-care diagnostics market will exhibit a CAGR of 6.9% between 2016 and 2024. At this pace, the market will reach US$11.7 bn by the end of 2024. Based on product, the demand for lateral slow assay stood out among other segments. By the end of 2024, the lateral slow assay segment is expected to hold nearly 38.3% of the global market. Regionally, Asia Pacific, North America, Latin America, Europe, and the Middle East and Africa constituted the key market share. 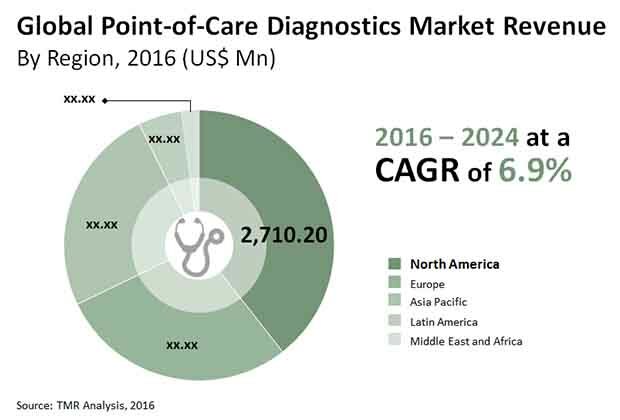 The global point-of-care diagnostics market is expected to witness the dominance of North America through the forecast period. By the end of 2024, the North America market is expected to hold a share of 38%. The rising incidence of chronic ailments is a prime driver of the global point-of-care diagnostics market. As the need for curb prevalence of chronic diseases rise, the demand for automated diagnostics is expected to surge. The past few years have witnessed rising investment in the design and development of advanced point-of-care diagnostic kits to make patient care simpler and more accessible. This is expected to prove a positive spell, enabling strong growth in the global market. Poor living choices are key reasons triggering the incidence of chronic ailments such as gastrointestinal diseases, cardiac ailments, hepatitis, cancer, respiratory and gastrointestinal diseases, and sexually transmitted diseases worldwide. Moreover, choosing unhealthy lifestyle patterns also cause medical conditions such as hypertension, obesity, and diabetes, which may require point-of-care diagnostics devices for round-the-clock monitoring. In addition, the prevalence of unmet medical needs across emerging nations in Asia Pacific and elsewhere will create growth opportunities for the market. According to the World Health Organization (WHO), nearly 14.1 million new cases of cancer was reported in 2012, which is expected to reach 15.5 million by the end of 2030. With this, experts also predict that market for point-of-care diagnostics is expected to get more expansive. Several diseases show symptoms, which demand precise testing by screening patients for multiple ailments. However, point-of-care diagnostics cannot screen multiple diseases at ones, which is one of its major drawbacks. Thus patients have continued to opt for laboratory testing so that they get accurate results. While dynamic medical diagnostic kits have started offering qualitative results, they are yet to offer quantification of data. This leaves chances for inaccuracy of interpretation and can hamper treatments. Despite prolific research and development in point-of-care diagnostics, these kits offer approximation, which can result in misdiagnosis. These factors have emerged as key challenges, inhibiting the market’s trajectory.